Last edited by LukeB; 24-09-2015 at 09:00 PM. Natasha and a Farrah feud coming? Me please! She won me over with her shade near the end. What does patriotic actually mean? I do know all the words to the national anthem and I have been in Buckingham Palace and I have met the Queen and Prince Charles and Wills and Harry. They were big Atomic Kitten fans back in the day! You're a mum of four. How will you cope with being away from your kids for up to four weeks? It's been many years since I've had to spend this much time away from the kids, but I'm treating it as a job. Don't get me wrong, there will be days when I'll probably be really down and missing them. I'll be thinking about the first day at school and things like that but I know they're well looked after. I've got their pictures next to me and I'm going to kiss them every day when I wake up and every night before I go to bed. What do they think of this? All of the boys are used to saying goodbye to me. They weren't phased. I think it'll probably hit them if I'm in for more than two weeks because I've never been away for more than ten days. It would be nice to do some music on my own in the future. It's a huge passion of mine and since the Atomic Kitten days my voice has really matured. It doesn't sound anything like it used to and when I sing a lot of people say, “I didn't know you could sing!” It's one of those life changing events. I do military boot camps and I like being ousted and taken out of my comfort zone. In life we've got to take these opportunities and go with it. You've done reality TV before in The Big Reunion and it changed your life because you met your partner, Richie. Will this be a similarly life changing experience? I'm 33 now so I think I know myself quite well, but it will great if I come out learning a bit more about who I am and how I tick. Will it be life changing? Who knows? It is what you make of it so I intend to enjoy it as much as I possibly can. Have you had any advice? Kerry was in and she was just like, “it's great fun!” She didn't give me any negatives, she just said, “You're going to love it, good luck!” As soon as I walk through the door the game has begun! I'm not someone who sits and overanalyses things, I live in the moment. There's no point in worrying, I'll take each day as it comes. I don't what to sound like I'm this psychotic, competitive person, but it would be great. If I've gone all that way and I get to the final then why wouldn't I what to win it? I will have gone through a lot to get there so I would want to be rewarded for my efforts. Other than your family, what'll you miss the most? My bed! And the smell of Rich. I have made him wear a tee shirt and I've got it with me so I can have cheeky sniffs every night! That sounds weird! It's my man smell, I love it. I'll miss the telly because I do like a Jeremy Kyle. But I'll have that live in the house, a front row seat. I'll miss music. I might annoy people singing. I do sing a lot which will be really annoying to people who don't have anything to do with music. I mean who wouldn't be nervous? Putting yourself in front of judge nation is a bit daunting but at the same time I've come this far now so I'll just go with the flow. I'll be nervous when I'm stood behind the doors and they introduce me. My knees will be knocking, definitely! But that's a great buzz, that adrenalin rush is what I love about performing and it will definitely be an experience. Who would be your dream American contestant? It would have to be someone a bit quirky like Cher. A proper diva with a million stories to tell. She could get me a job in Vegas! Who would you hate to see walk through those doors? At the end of the day my biggest idol could walk in and be a total let down so I'll try not to have preconceived ideas of people. I know the Yanks won't know who I am but I really hope that I know who they are because I would feel really bad because it's awkward! Is there anyone you've seen on the show and thought they handled it well? Chantelle did really well I think. To be out with a load of celebrities and have to wing it. She showed vulnerability and I think that is something people like to see. You have this TV persona so people don't really know who you are. I think people will be surprised by how normal I am. It'll be nice to show my softer side because when I'm with Atomic Kitten it's all high tempo and having fun but I've got more substance than just being a girl from a pop band and it would be nice to get that across. How will you introduce yourself to anyone who doesn't know you? I'll just say I'm from a band who were very successful many years ago! We sold ten million records worldwide! Apart from my children, Atomic Kitten is one of my biggest achievements and I'm very proud of it. We worked really hard and I've been in the industry 17 years now so we have done well to get this far. Do you worry about what the crowd will be like? I'm just expecting booing so anything that isn't booing will be a bonus! It'll get me a bit of practise for panto at Christmas. How will you deal with any arguments? If I feel like there is a bit of tension building up between me and a Housemate I will say, “Can we go outside and talk about it?” I don't want to spend days with a knot of anxiety in my stomach because then I'm not enjoying the experience. If there's a problem I'd like to think people will come to me because I'll listen to them. There will be people who are more reserved and I think it'll be the Brits. But if it's no fight between us and them it's us all the way. I'll be fighting hard. How will you deal with other celebs getting it on? It doesn't bother me as long as it's not on my bed! Me and Rich are fans of the PDA. When I first got with Rich I wouldn't even hold his hand in public. The kids are always like urgh, stop! He's behind me 100%. They say that absence makes the heart grow fonder and I think when I leave it will be a good night! I can't even contemplate it. It would be nice to win but I can't imagine what it would be like to walk out to that kind of response. I can't fathom it. 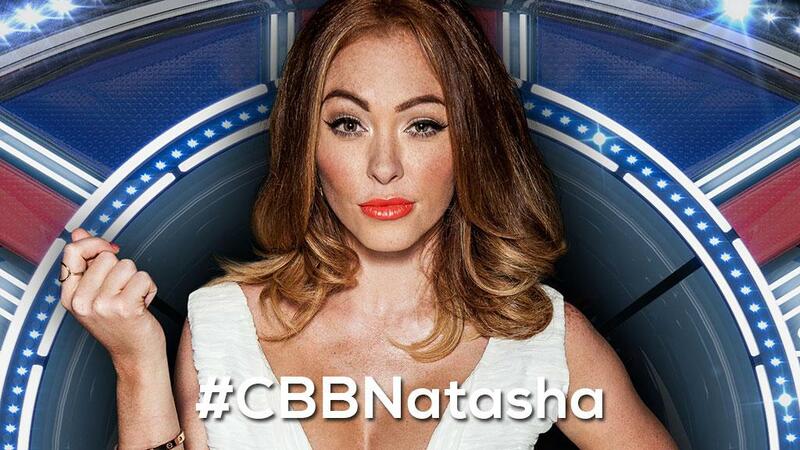 Natasha's interview on the CBB website.